The most significant parts of an extraordinary, recently discovered Civil War memoir, created in art as well as word, see the first light of day. Sneden, a Canadian immigrant into Connecticut, joined the Union forces as a young man of 29, served in some of the worst fighting in Virginia, was captured and interned under the awful conditions of Andersonville, and lived to tell his tale. He told it in a postwar memoir (based on voluminous diaries, still lost) and a series of vivid, affecting watercolor drawings and maps, only recently found and only now becoming known. The watercolors, many of them reproduced here in beautiful renderings, record as few other known battlefield artworks the realities of fighting and imprisonment. Sneden's maps have the brilliance both of guides to land and structures and of true artistry. Fortunately, the written reports of what this soldier saw match the images captured in his art. They reveal a sensibility stripped by battle of any Victorian excess. Modern in their understatement, powerful in their simplicity and directness, they not only provide a record of the engagements and situations in which Sneden found himself—they sweep the reader along by their force and clarity. Bryan and Lankford (both of the Virginia Historical Society) have pared Sneden's manuscript memoir and selected its freshest and most compelling parts in a high act of editorial scholarship. The result is one of the most compelling additions to Civil War literature in many years. 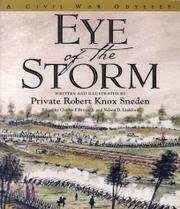 A fine work, as winning in its production as it is riveting in its contents, for everyone captivated by the Civil War.